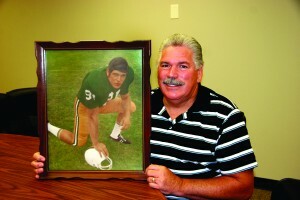 Porter today with a hand-painted image of his days at Baylor. That could be Sam Porter’s theme, but just like the message of the song, the “Anchor Holds,” Porter’s life is a testament to the fact that God holds on to His children leading them in the way He has planned and serves an an anchor when those dreams become His. 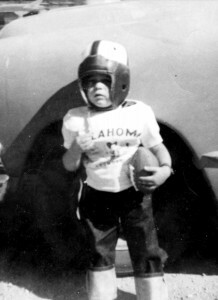 “As I was growing up, all I ever wanted to do was play pro football and be a rancher,” said Porter, who now serves as partnership and volunteer missions specialist for the Baptist General Convention of Oklahoma. 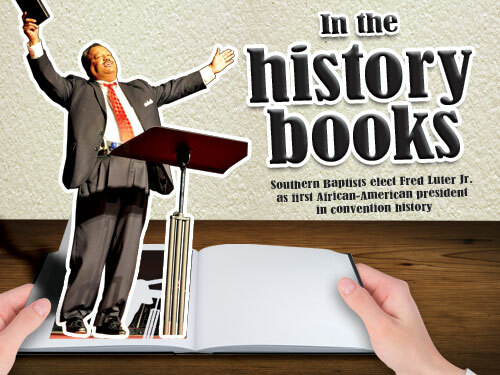 And that dream dangled in front of him during his first year at Southwestern Seminary. Porter was saved at age 9 at Marietta, First, and was called to preach at Falls Creek when he was 14. But Porter was also playing football in a small community football town. Marietta, in southern Oklahoma, won the 2A State Football Championship when Porter, a defensive and offensive lineman, was a sophomore. In his senior year, the school lost in the state championship game. Out of a graduating class of 46, five went to college on football scholarships. Porter was recruited by Baylor and Oklahoma State, and could have had a visit to the University of Oklahoma. From a 2-year-old to a Baylor lineman, Sam Porter’s dream was to play football. “I just knew in my heart I was going to play college ball at Baylor, even though they had not offered me a scholarship,” recalled Porter. He was offered a scholarship on signing day, and played defensive end and outside linebacker for the Bears. Porter was redshirted, then played two years for Coach Bill Beall, whose record at Baylor was 3-30. Grant Teaff followed Beall as head coach, and turned the program around (128-105 at Baylor). 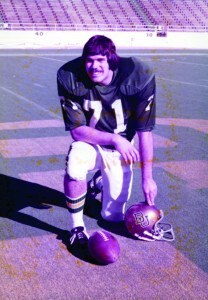 Porter recalled his first game at Baylor, which at that time played in the Southwest Conference, was at Memorial Stadium in Austin against the University of Texas. However, even with his call to ministry, Porter thought he could still play football and preach. After graduating from Baylor, getting married and entering seminary at Southwestern in Fort Worth, Porter had a chance to capture his dream. Forrest Gregg, then coach of the Cleveland Browns, offered Porter an opportunity to join the Browns as a free agent. Porter said not following his dream, but following God’s calling, was one of the hardest decisions of his life, and it took him a while to come to grips with it. Actually it was Bill Tanner (a Baylor graduate, and former OBU president, NAMB executive and executive director of the BGCO) who helped Porter get a handle on his decision. Porter said after he settled the issue, God changed his heart. Porter said he has tried to do ministry with the same fervor he put into football. That training has helped Porter in his ministry positions as he has traveled the world, as Oklahoma’s disaster relief leader, helping people recover from devastating tragedies, and as partnership ministries specialist, leading and training groups to minister around the globe. Porter emphasized when he was in difficult situations as a pastor and ministry leader, he realized he had been in more difficult circumstances.